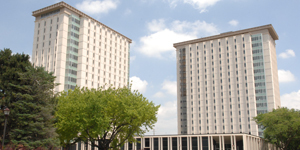 Manchester Hall, a co-ed residence hall connected to Hewett Hall, is located near Milner Library and the Bone Student Center. Manchester remains open throughout all university breaks during the academic year (this is referred to as nine-month housing).The beds in Manchester Hall can be bunked and the desks are movable. Manchester Hall was named after Orson Manchester, a Dean from 1911-1928 at Illinois State Normal University. The building opened in 1966.